Editor’s note: Jonathan Sills is a former marketing executive who is now an entrepreneur-in-residence at Battery Ventures. Succeeding as a modern, high-tech marketer means adapting to accelerating changes in technology — whether that’s leveraging Facebook’s newest features, segmenting customers with even more granularity or finding a new platform for viral distribution before the rest of the business world takes notice. While some marketing principles and approaches stay the same, every year brings new opportunities and threats. And marketers who recognize these disruptions earlier than others have the best chance to leapfrog competitors and crack open new markets. The coming year is no exception. In that spirit, I’ve had several CEOs and marketing executives ask me about trends ahead, so I decided to package some of these conversations for others to see. To further inform these opinions, I canvassed some of the smartest marketers out there at fast-growing tech companies to solicit their input and reactions. Below are some predictions for what marketers should anticipate in 2015. The targeting of individuals through digital ads has continued to evolve toward identity rather than behavior. So the focus is increasingly on “who are you” versus “what are you doing” right at this moment. 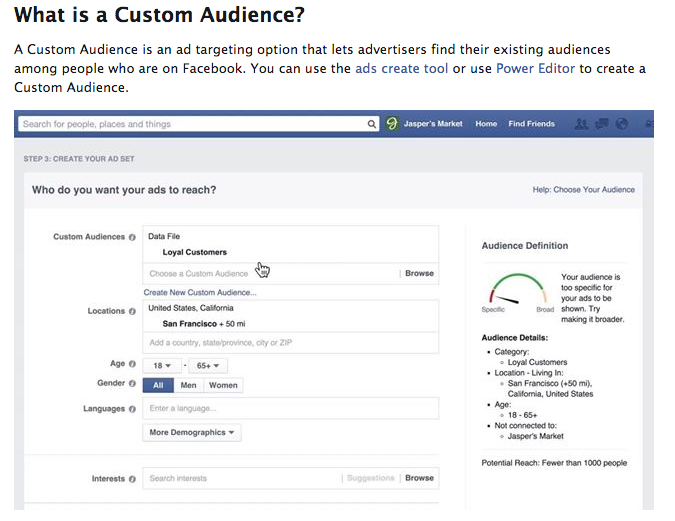 One of Facebook’s most successful ad-product developments has been the ability to upload “custom audiences” that marry advertisers’ customer lists with those individuals’ social profiles (subject to various privacy policies, of course), enabling advertisers to reach these targeted groups (and those who look like them) specifically. So a company selling widgets online could upload a data file of their most loyal customers and communicate directly with them about the latest product releases and developments. Google has continued to inch toward this approach, building “similar audiences” off remarketing lists. But with the massive success Facebook is seeing here, it’s hard to imagine they won’t follow suit in a more specific and compelling way. Most TV ads will continue to be bought ‘linearly’ despite attempts to create programmatic platforms and household-specific solutions. Television advertising, despite the growth of online video, continues to play a role in marketing budgets for traditional and emerging businesses. For those wishing to target households more finely at the subscriber level, online, or through people’s tablets and smartphones as they’re watching video, there’s certainly a long line of partners waiting to take that money. A variety of interesting opportunities continue to surface from the cable/satellite/fiber providers here as well. But despite these efforts, we still seem a few years away from a fundamental disruption in the way television advertising is purchased — namely, in a non-interactive, linear way, with ads being paired with specific broadcasts at set times — be it a football game at night or the History Channel during the day. Some of the largest publishers serving native ads through third parties will decide to take the business in-house. May the line between editorial and advertising rest in peace. Native advertising, or ads that match the form and function of a particular website, e.g. they look and act a lot like the regular story placements on a site like CNN or Business Insider, has become a rule rather than the exception on a wide variety of independent content sites. So it seems likely that some of the largest publishers may choose to take a crack at keeping 100 percent of the margins in-house rather than outsourcing the work to a third party – despite the requirement for more work on their end. AOL buying web-personalization engine Gravity provides one example. Mobile-centric CRM solutions (e.g. push notifications, interactive notifications, rich media messaging, etc.) will make material inroads in serving as an alternative to email for companies communicating with customers. This is a tricky one to call, but it does seem that traditional email marketing as a way of effectively reaching customers and prospects is falling subject to more and more pressure every day (migration to mobile; intelligent inboxes; Google’s “promotions” tab; improving spam filters). Kahuna and Iris Mobile are two of several companies doing interesting work around new and alternative engagement paradigms. Here is an example: A widget company releases a new product, and Kahuna sends personalized push notifications to phones rather than a traditional email blast. And retargeting technology continues to evolve and become more intelligent. Ideally the new stand-ins for email campaigns will be more tailored and personalized and seem like less of an intrusion as a result. While I haven’t had an opportunity to demo the Apple Watch, I’m intrigued by the new interaction models Apple has laid out: sending “touch” and “tap” messages, quick doodles, and further abbreviation of messages and intention. Siri seemed to have this potential but fell short. Anything on-demand and easy that facilitates communication and commerce has the potential to reshape how we reach new customers and more intelligently play a value-added role in their daily lives. It seems like a better platform for marketers with more likelihood for quick consumer adoption than Google Glass.